Whether you fish from an ice house or like to move around spot to spot, tip ups are a fun and versatile way of catching fish on the ice. They are great for covering lots of water, as well as supplementing your main holes in your shelter. There is something exciting about seeing your flag go up, taking off in a sprint to see what’s on the line. Perhaps that is why so many become die hard tip up fishermen. Tip ups have been around for many years, and have gone through many improvements, despite looking nearly exactly like they did decades ago. The bite triggers are more sensitive and reliable, and there now several excellent styles to choose from. In this guide, we’ll review the best ice fishing tip ups in each style, and which are worthy of adding to your ice gear. What Type of Tip Up? There are several styles of tip ups made today, but they all break down into a few basic components. You have a base that sits over the top of the ice hole, an arm with a spool of line, trigger bar, and spring loaded arm with the flag. 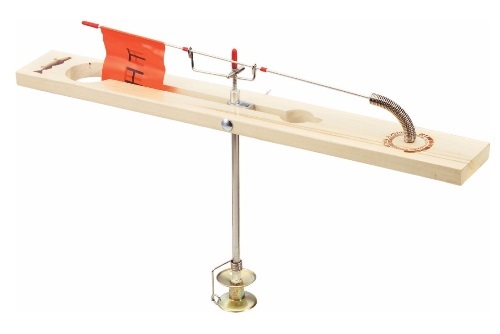 When a fish takes your bait, it pulls on the line, which turns the arm and triggers the flag to pop up. Then the fun begins. An individual tip up is relatively cheap, but nobody runs just one. When you stock up on 4 or 5 at a time it becomes a more costly purchase. Mechanisms and sensitivity vary between the different styles and materials, so review these features before you load up on tip ups. Traditional Hardwood – This is the time tested design most ice fishermen are familiar with. 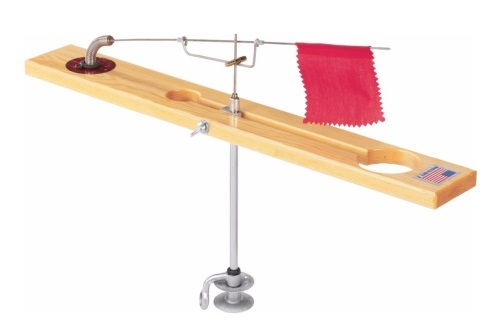 It features a durable hardwood wood plank, and a pivoting arm with line spool. The simplicity of the bite trigger mechanism makes it highly reliable. Only once a fish has taken the bait will the the flag fly. The only downside is the higher cost, relative to cheaper plastic versions. Pro Thermal – Thermal style tip ups solve several problems some anglers have with classic tip ups. First, the round insulated base totally covers the ice hole, preventing it from freezing over in the coldest temperatures. You spend more time fishing and not babysitting your holes. Second, the cover blocks light from going down the hole, which can spook early morning fish. Lastly, pro thermal tip ups are round and stack perfectly in the 5 gallon buckets that ice fishermen love. Windlass – These innovative tip ups harness the wind to jig your bait. A small sail on the back of the arm sways with the wind, giving your bait a subtle jigging action. While it’s a great idea, when it works, the drawback is reliability and limited usefulness when the wind is higher than a breeze. Rod Holders – An ice rod holder is a good alternative to a tip up. 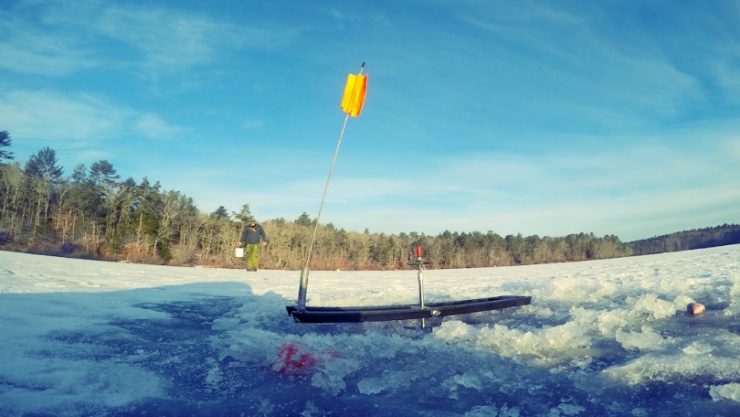 Hang the ice rod over the hole, and your bait will hover in the water without using a float. It’s great for the most sluggish, subtle biting fish and doesn’t need a trigger. The fish takes the bait and the rod tips down. All you need to do is pick up the rod and reel. Did you Know? The original Beaver Dam tip ups were called Arctic Fisherman tip ups, and are something of a collectors item. They were first developed in the 1930’s, and are still made individually by hand in the United States. Materials – Classic style tip ups are traditionally made from planks of hardwood. Plastic tip ups are good too, and cost a fraction of the wood models. Plastic is cheap, but in the cold are prone to bend and break far easier than wood. Wide Base for Stability – No matter what style tip up you’re looking at, it has to have a long, wide base to be effective. The base needs to be stable over the hole to present the bait and not fall over if a fish takes it. Round thermal tip ups are more stable than planks, and bow tie shaped planks are better than narrow planks. Trigger Bar – The trip bar is what sets the tension on the flag and spool. Most tip ups can be set from light to heavy depending on the species of fish. 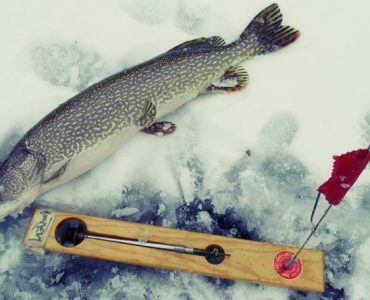 Set it heavier for big fish like Pike, or when the wind is howling to prevent false flags. The better the trip mechanism, the more reliable and effective the tip up. Flag – When the trigger is tripped, the flag pops up indicating a bite. Choose one with a bright color that your eyes will see well. 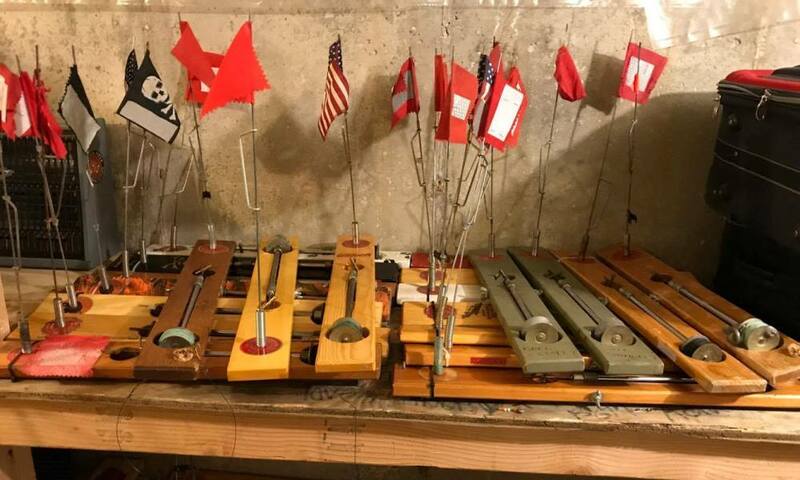 Some anglers even have fun customizing their flags for sports teams, US flags, and other weird stuff. Bait Keeper Clip – This clip is best used with heavier weights and large live bait that moves a lot, like sucker minnows. The clip holds your line underneath the board to prevent annoying false flags. 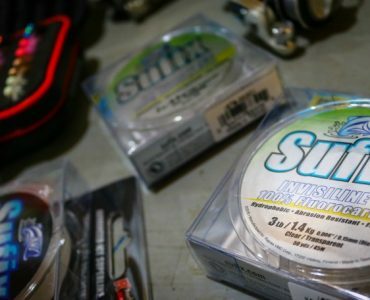 Storage – Because ice anglers use multiple tip ups at a time, most are designed to be storage friendly. The traditional board tip ups usually have slots where the rod, spool, and flag can fold into and secured. Round tip ups are similar in that they fold up into a size that stacks nicely in a 5 gallon pail. Here are our 5 favorite tip ups, each proven to be excellent at their job. We have top choices for each style, and for any type of fisherman. Best Overall Tip Up: If you’ve ever dealt with freezing over holes with your regular tip ups, it’s time you had a look at the HT Polar Therm Extreme. These insulated tip ups are basically to do it all tip ups you’ve always wanted and needed. It has a 12 inch diameter plastic base that covers up to a 10″ ice hole, and keeps them snow and ice free. 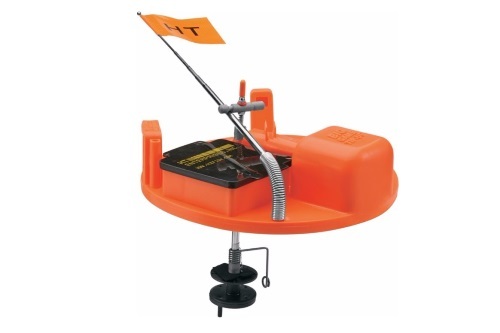 A small tackle box is built into the top for extra hooks, leaders, and terminal tackle. Then you have a built in holder for a light stick for easy night marking. What about storing these, aren’t they kind of big? Nope, HT has thought of everything and made it perfect for storage and transport. 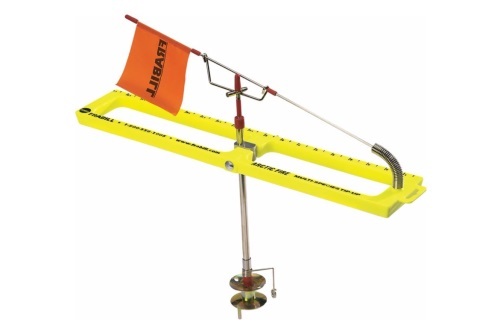 The flag pole is telescoping, and clips onto the base allowing you to stack half a dozen tip ups into a 5 gallon pail. It doesn’t get any easier than that! Best for the Money: The Husky DLX features a wood base with polyurethane coating for protection from water. 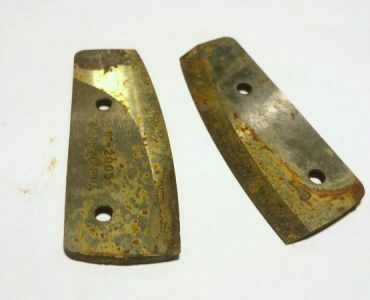 All the metal components are corrosion resistant. The line trigger has two settings, and each are extremely smooth. The spool has a 200 foot line capacity and has a built in line winder. The Husky is designed to operate well in freezing temperatures. Many users have reported no issues and smooth spinning even at sub zero temperatures. The HT Husky DLX is a well built tip up, with quality materials all around that should last for decades of ice fishing. With great performance and at half the price of a Beaver Dam, this tip up earns out top recommendation. Best Traditional Tip Up: The Frabill Classic is another excellent hardwood tip up option for those who prefer traditional plank style tip ups. It features a hardwood board, with urethane coating for durability. Two settings on the shaft and trigger allow for light to medium bite detection. The shaft and bearing surfaces are lubed up fro cold temperature operation, and easy maintenance. The cloth flag (not stiff plastic) will get your attention, it actually waves in the wind when triggered. Check out the line spool, sized for the standard 200 feet of line and has two convenient knobs on the bottom for quick line retrieval. 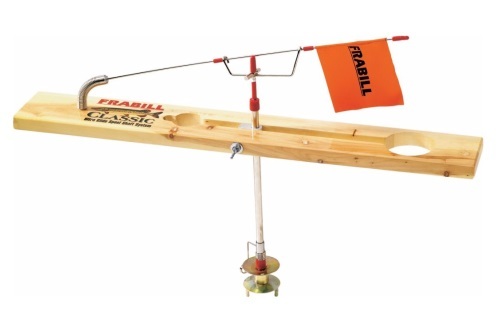 If you want a cheaper wood alternative to a Beaver Dam, the Frabill Classic is hard to beat. Best Cheap Tip Up: Could you not care less about wood for tip ups, and only want the best cheap model to stock up on? Look no further than the Arctic Fire from Frabill. It takes all the best features from the classic style plank tip ups, and puts it into a bright, durable package. The base is made of a durable, temperature resilient Polypropylene plastic, and features a built in ruler along the side. The spool has the wind up handle and line loop to quickly set up your bait. For a such a cheap tip up, the Arctic Fire is durable design that has served ice angler well over years of fishing. Best Classic Wood Tip Up: For the ice fishing purist, you can’t beat the original Beaver Dam Tip Up. They were among the very first to come out with a reliable trigger and flag trip mechanism, and have a special place in many anglers memories. The line spool is smooth, and has a simple loop for setting your line quickly. Each Beaver Dam Original is still hand made in Beaver Dam, Wisconsin. The Beaver Dam is an excellent investment in a classic, proven tip up design that is Made in America . 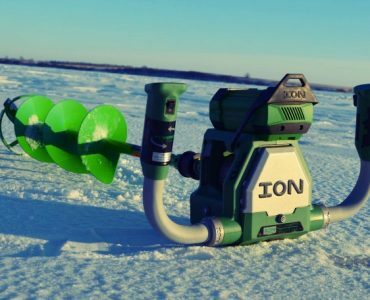 The tip ups are pricey, but they will last you for decades of ice fishing.